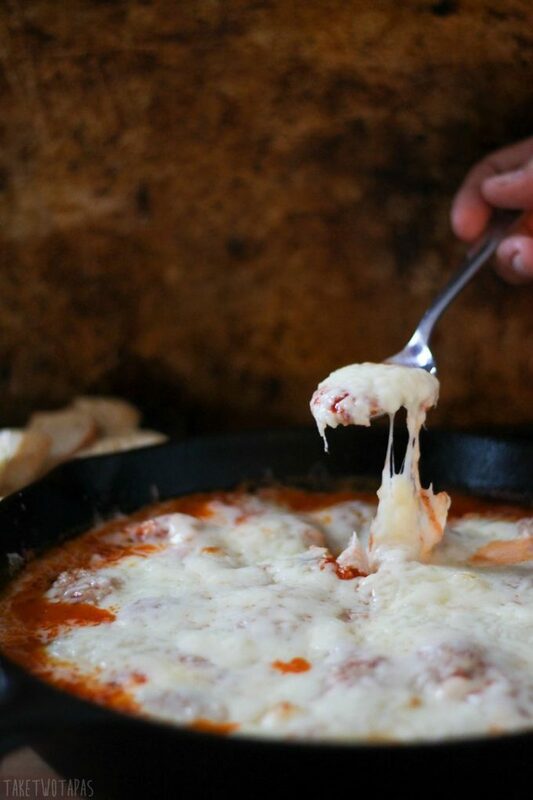 This meaty and cheesy meatball dip is baked in a skillet, loaded with mini meatballs, rich tomato sauce, and four kinds of cheese. Perfect for a party and the skillet makes its own serving dish! Have you heard the name Assunta Cantisano? If not, let me tell you about her. She was an immigrant from Naples, Italy who traveled to the United States in 1914. She settled in Rochester, New York and planted a family garden, just like so many families are doing these days. She brought with her a family recipe for tomato sauce. In 1937, during the great depression, she started selling her homemade sauce on her front porch. Her sauce grew so popular that she started the Ragu Packing Company that still sells her family recipe today. I did not travel from a foreign country, but I do have a diverse family background. Just like Assunta Cantisano, I have many wonderful family traditions, mostly involving food. My grandfather was from the Bahamas and I have several recipes that I look forward to sharing with you in the future, but today I am going to talk about a family tradition that started with a marriage, includes a restaurant, and continues with an annual Thanksgiving family reunion. Since we are always talking about food here, you could say that my family is #SimmeredInTradition. Shortly after my mom remarried, I was 5 at the time, we started out Traveling Thanksgiving Reunion. You can read about that crazy reunion in these posts if you dare. After a few years of wedded bliss, my mom, Kathy, and my new step-father, Bob, decided to buy a restaurant. 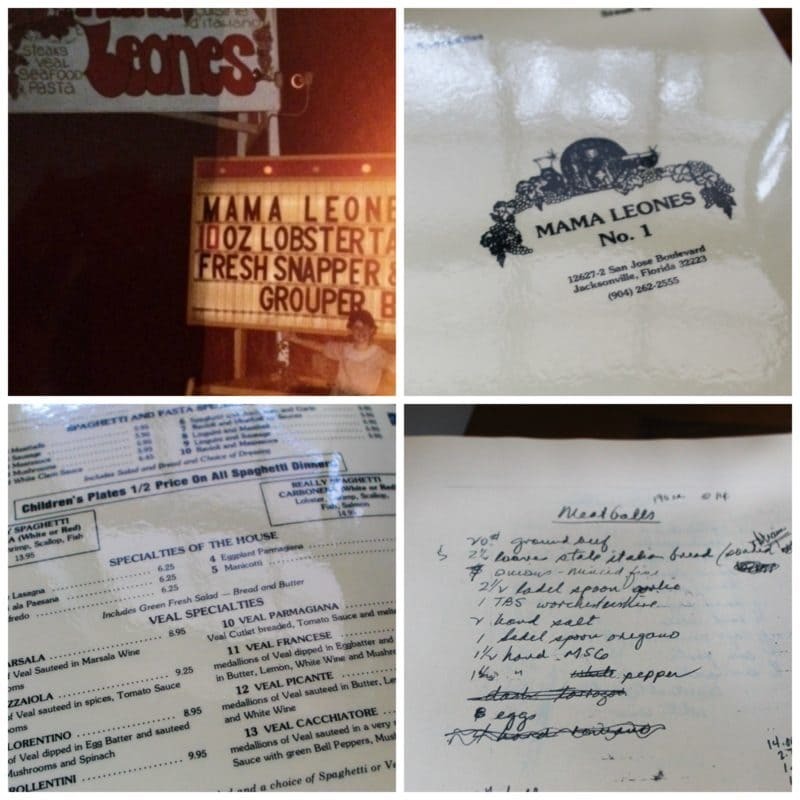 They bought Mama Leone’s in Jacksonville, Florida, and it quickly became a family affair. Us kids all had various jobs there: cashier, bus girl, dishwasher, salad dressing maker. Mine was to bus tables and clean the calamari. It was hard work but so much fun being together and cooking. Don’t use a glass to scoop ice out of the ice machine. I broke a glass inside the ice machine and the whole thing needed to be drained. Don’t have a tomato fight in front of the salad station wearing a white shirt. Everyone will know what you did. Here are some of the pictures from the restaurant. That’s me in the upper left corner, presenting the specials for the night. To the right, and the bottom left is a copy of the last menu we had and then in the bottom right is a handwritten recipe for meatballs. 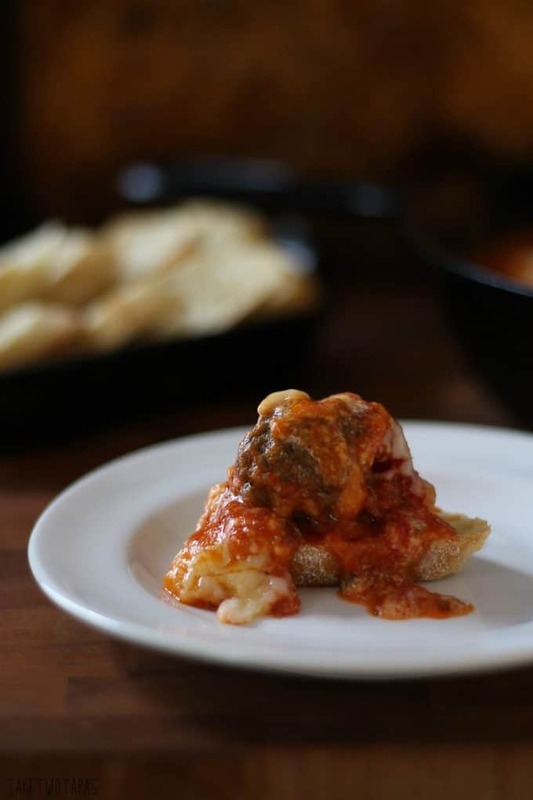 This meatball recipe is what I used as inspiration for this new meatball dip recipe. 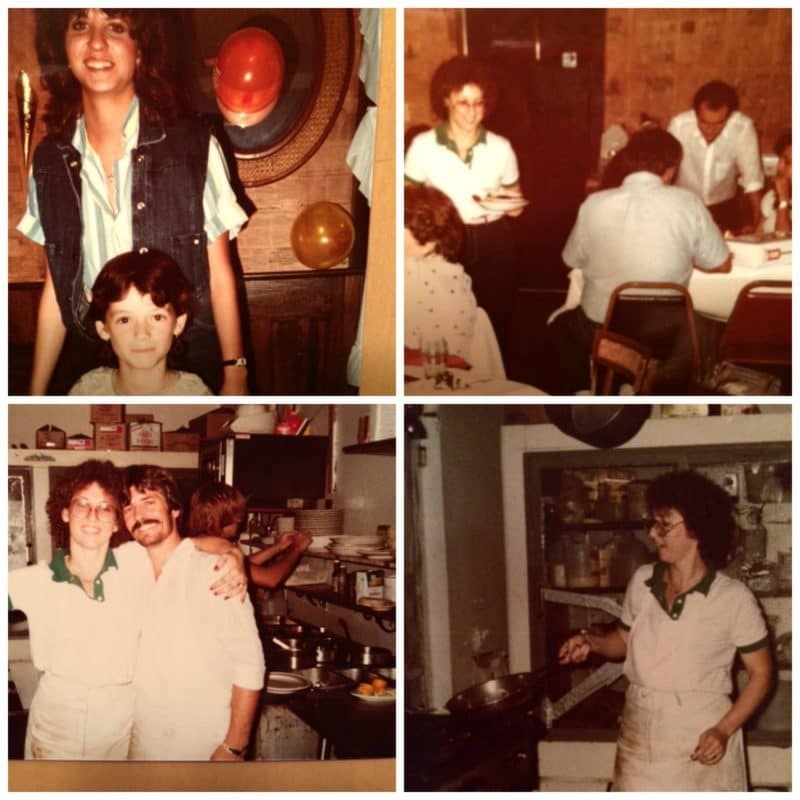 When Bob and Kathy bought the restaurant from “Tony The Greek,” they spent a few weeks learning the recipes and other aspects of running a kitchen. A black and white composition book contains those recipes, each one handwritten by Bob, and all the pages are splattered with either dressing or spaghetti sauce. All of us kids still look at that book, make those recipes, and carry on the traditions of Mama Leone’s. When Bob passed away in 2003, Kathy made all the kids a copy of the menu for Christmas. That’s mine in the photo. Now we all have a copy of that precious book. Kathy didn’t make copies of ALL the recipes, so we occasionally have to take a look at the original book. I think she did that so we would all come and visit. Don’t judge the hair, it was the 80s. I have fond memories of working there and those traditions have shaped my life today. I have worked in kitchens since I was little and still do today. 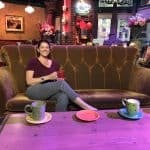 I feel most at home there. I cook at our church on Wednesday nights, sub for the cooks in the local diner, and spend quite a bit of time in my tiny kitchen here at home where I make recipes for the blog. When thinking about being #SimmeredInTradition, I think about Mama Leone’s meatballs simmering in rich tomato sauce. I think Assunta Cantisano would be excited about the merger of two great food traditions. Her sauce and my family’s favorite meatballs. What can we do to marry the two traditions? Cheese! 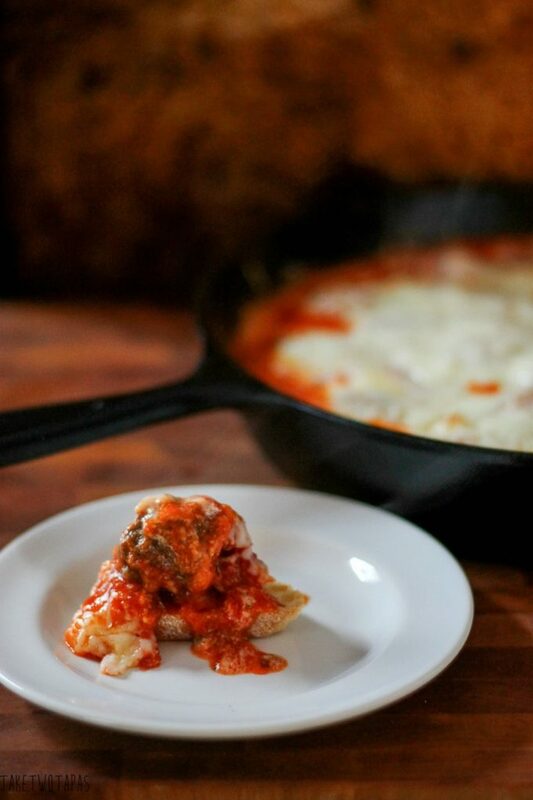 I made a miniature version of Mama Leone’s meatballs, because at Take Two Tapas we are all about the small versions of things, added a few of my favorite cheeses, and bound it all together with Assunta Cantisano’s Ragu tomato sauce. I used the sauteed onions and garlic variety for this meatball dip. What are your family traditions? Do you have any that revolve around food? 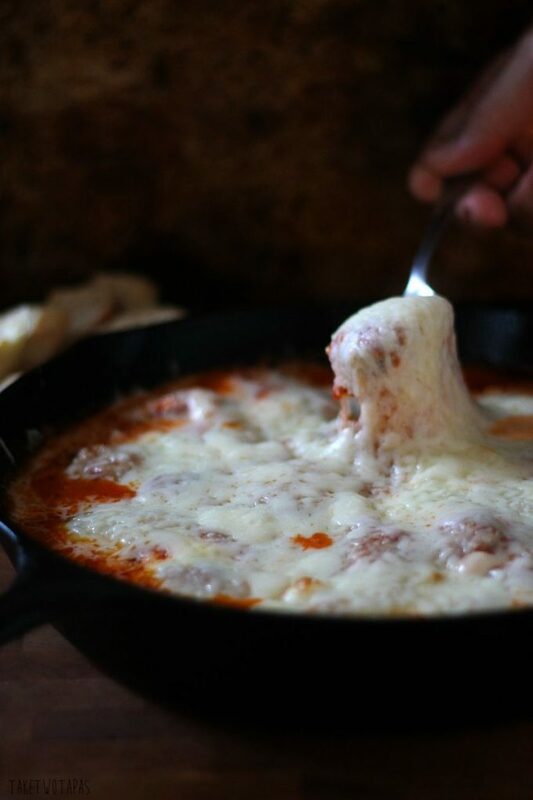 This meaty and cheesy dip is baked in a skillet and is loaded with mini meatballs, rich tomato sauce, and four kinds of cheese. Perfect for a party and the skillet makes its own serving dish! While you are preparing the meatball mix, soak your bread in the milk. In a separate bowl combine all the remaining ingredients for the meatballs. Drain your bread slices, squeezing slightly to remove excess milk. Add to the meat mixture and mix until fully incorporated. Roll mixture into 1 inch balls, I used a small ice cream scoop. Bake at 375F for 15 minutes or until brown on the outside and meat cooked through. Place your meatballs in the skillet (about 40 of them) so they are even spaced around the pan. Dot your ricotta and mascarpone cheese in between the meatballs. Bake at 375F for 15 minutes or until bubbling and cheese is melted. Such a cute post, I love seeing the old pictures and the story behind them! I have a meatball crazed child 🙂 would be over the moon for this. What a great idea! I wish mine would eat them. I guess more for us! I feel like I need to be eating this right now. Like, immediately. Love food that’s rooted in tradition like this! I’ve never heard Assunta’s story before so I really enjoyed reading it here. And this dip looks amazing, a definite crowd-pleaser! What a precious post Jen!! Loved seeing the kid you.. N yup, no tomato fight in white 😉 the dish looks sooo delicious… perfect!! This is perfect for any season. Love the flavors and the Ragu is so perfect for this recipe. Thanks! I can’t wait to make it for next week’s tailgate! Thank you for sharing this wonderful story. I love this history behind recipes people share. Me too! Make me happy to see so many people having fun in the kitchen and continuing traditions. Wacky and fun! You had me at meatblls. And I had that exact hair. Good times! I did too Dorothy! I love looking back at old pictures. I wonder what my kids will think of pics when they are much older? Sounds delicious! I loved reading about your family traditions and memories! Many of our family memories are centered around food as well…this is one family that loves to cook and eat! Those were fun times. Thanks to you, we all learned not to use a glass in the ice machine. Prep time was always a blast. Will definitely try this recipe. Sounds and looks yummy! We learned a lot more than those two things but they were all so much fun! I remember squeezing the fresh chopped parsley in the white towels too! I would LOVE to taste this, especially all that cheesy goodness! We have lots family traditions and memories around food, especially during April when it’s the Sri Lankan New Year. That was always fun with my Grandmother!! Thanks Dini! I hope you will write about those New Year traditions! I love learning about new cultures! I bet you have some great traditions! Oh yummy! And what great memories of growing up in the restaurant! I love how you didn’t get all of the recipes so you have to come look at the original still, moms are tricky like that!